I had cancer. I feel guilty writing that. Guilty because many people's cancers are much more serious and advanced than mine was. I don't even feel like I'm in the same category as those brave people who have fought so hard. And also guilty because I'm almost positive I had a part in causing my cancer. An hour and 20 stitches later, the melanoma was removed. The cancerous mole was only the size of a pencil eraser, but my doctor took out a silver dollar-sized amount of tissue. I have a nearly four-inch scar on my back. I AM SO BLESSED AND SO LUCKY. A simple surgery and a scar are NOTHING compared to what cancer dishes out to so many people! But the thing is, if I had not been going to a skin cancer screening appointment every year, this could be an entirely different post. The mole was in a spot I rarely ever see - the middle of my back. And even if I had seen it, I may not have noticed anything unusual about it. Melanoma is very easy to treat when caught early, but very difficult to treat once it spreads. It's deadly. It's a type of cancer that doesn't respond well to chemo; luckily new immuotherapies are offering hope. But for many, there is no cure. But there is prevention. Skin cancer is a type of cancer in which prevention efforts really make a difference. That's where I failed. I grew up a swimmer, with a pool in my backyard, always riding bikes and rollerblading outside. Then later in life, I was a lifeguard and a swim coach...and yes, worst of all, I used tanning beds. My UV exposure was through the roof. But all of that changed after melanoma. I live in Florida, five minutes from the beach, and I'm the most pale I've ever been. Self tanner is my best friend. Tomorrow I have a skin check up appointment. Because of my history of melanoma, I have a screening at least once every six months. Studies by the National Institutes of Health have concluded melanoma survivors have a nine-fold increased risk of developing a subsequent melanoma, compared to the general population. I rarely leave the dermatologist's office without something sliced off. I have weird marks and little scars all over. I'm the worst patient, so trust me when I say it's nothing to be scared of or avoid. I know so many people who have spent a lot of time in the sun but still have never had a skin cancer screening! What are you waiting for? Yes, you have to get nearly naked, yes, you might have something removed. But really, it's quick and easy. Really. I'm not lying. I feel selfish telling that whole story before pointing out that my mom had breast cancer. Although she can tell her story much better than I can. She was shopping at a boutique that had a MD Anderson Cancer Center mobile mammogram unit parked outside and some ladies urged her to get a mammogram. She resisted because she didn't have an risk factors for breast cancer. Luckily, she did have the screening. Her breast cancer was caught early and removed with a lumpectomy at MD Anderson. Again, our family is blessed! What I like to point out about my mom's story is that, a few years ago, the U.S. Preventative Services Task Force put out a controversial recommendation that most women wait until age 50 to start having mammograms. My mom was diagnosed with breast cancer a few years before she turned 50. And just recently, ABC News Anchor Amy Robach was diagnosed with breast cancer at age 40 after having a routine mammogram on-air for a story. 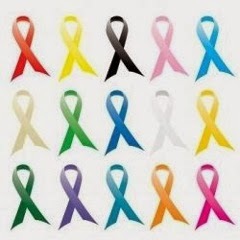 Today, February 4, is World Cancer Day. February is National Cancer Prevention Month. It's a great time to think about how lifestyle factors, such as exercising, eating a healthful diet and wearing sunscreen, can possibly reduce our risk of cancer. Unfortunately a lot of it is out of our control; people get cancer for reasons we don't know or understand. Therefore, early detection and raising money for research are some of the best tools we have at this point. I'll be attending a Moffitt Cancer Center Women's Cancer Awareness luncheon next week. I look forward to sharing stories on-air about strong people facing this awful disease and the doctors and researchers working to help them beat it!